In life, Nul was a shifty bounty hunter who spent years attempting to break into Castle Grayskull, obsessed with the countless legends that it contained the power to be Master of the Universe. In death, he was cursed and banished into the dimension of Infinita, forever chained to his past crimes. 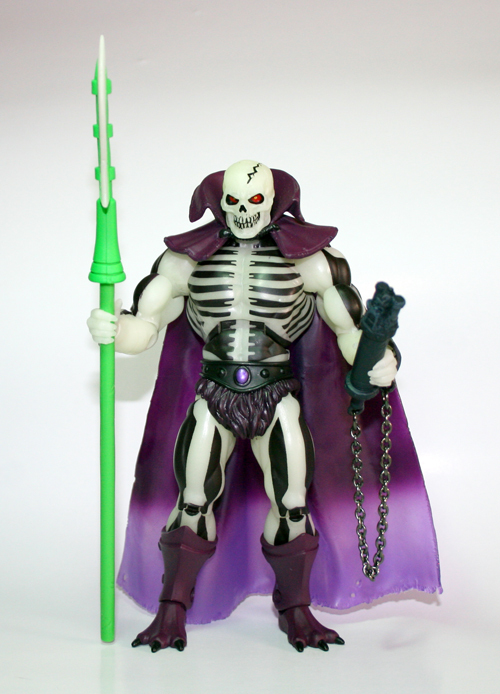 He was brought back to Eternia by a magical spell of light cast by Skeletor to locate the most evil warriors in the five dimensions. Provided with a Scythe of Doom, Nul agreed to join forces with Skeletor and quickly became known as Scareglow, thanks to his ability to burst forth and freeze his enemies with fright. Back in the 80’s, Scareglow was one of the figures released near the end of the vintage line and due to this, it’s one of the most sought figures for vintage collectors. Dubbed as “The evil ghost of Skeletor”, Scareglow cause some confusion since no one back then could figure out if this was Skeletor in ghost form or an evil ghost at Skeletor’s command. In the classics line, a back story was created for our pal Scareglow and now we know who he really is. The classics version is very true to the original, yet improved in many ways like all the other figures in the classics line. 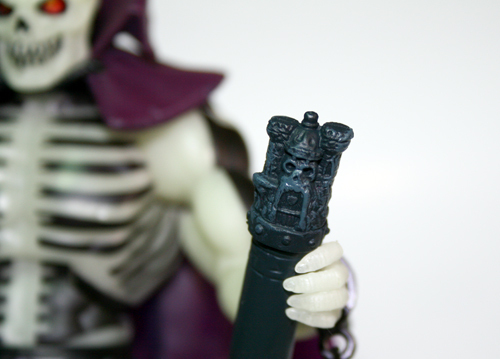 Scareglow comes with one of the most peculiar accessories of the line (so far): A Cursed Grayskull reliquary that contains the key to Castle Grayskull but it’s impossible to open (at least for the bad guys since we can open and check the key inside). This is one of my favorite figures of the line, Scareglow is one of those figures that’s impossible not to like. 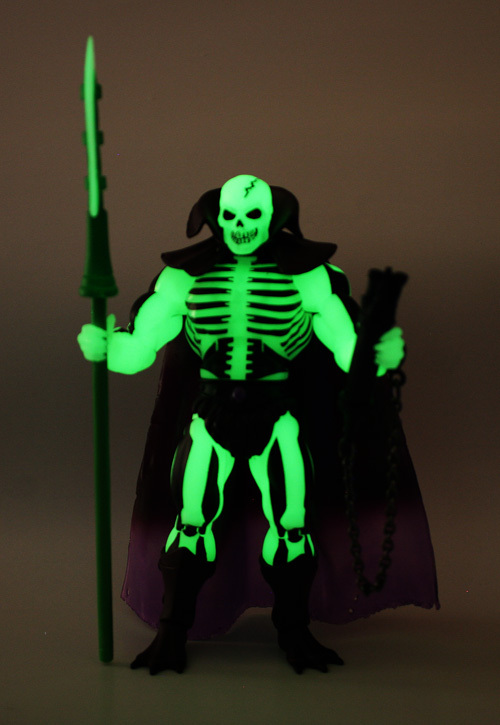 He’s a skull, he has a Scyth, a cape and he glows in the dark! The cool factor is way over the roof on this one. Try to sleep with this guy on your nightstand… guaranteed grim reaper nightmares! 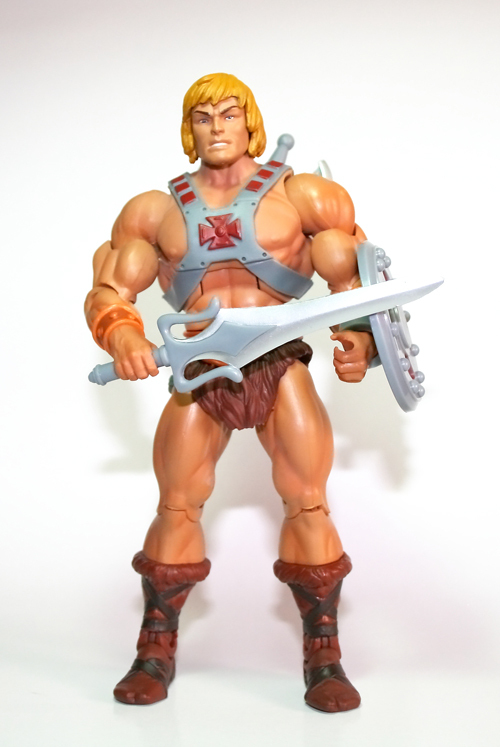 I really tried not to start the Masters of the Universe Classics line reviews with He-Man, but it wouldn’t be the same… He-Man is the main character of the line and series, so it would only be fair to start with him. There will be other He-Man figures I’ll review later on this MOTUC review series but this is the main one, the quintessential tribute to the action figure that drove kids from all over the world completely insane in the 80’s. 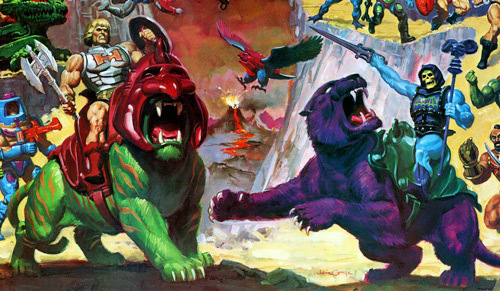 So, ladies and gentlemen, we start our series of Masters Of The Universe Classics reviews with He-Man: The Most Powerful Man In The Universe! 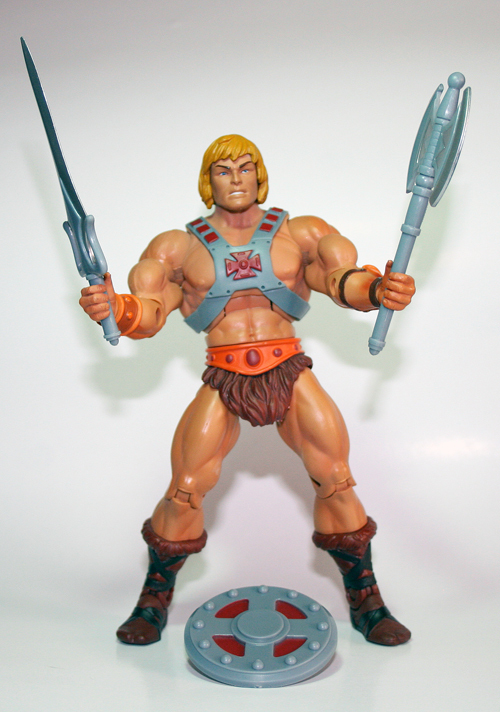 Although He-Man was not the first figure to be released in this line (King Grayskull was the first), he was the first one I managed to get when it was re-released in November. The figures in this line are a tribute to all the MOTU lines released in the 80’s, 90’s and 200x’s, all of them adapted to today’s action figure standards. There are lots of points of articulation in all the figures which make them very posable, but the what gives extreme value to this figures is the beautiful sculpting made by the Four Horsemen. 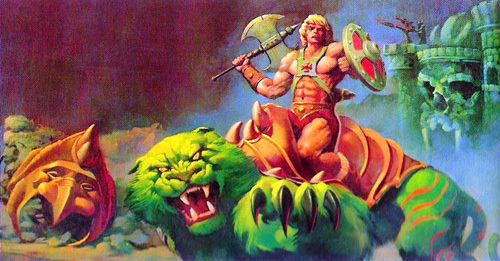 While you can immediately identify He-Man (and all the other figures), there has never been such a beautiful and detailed figure of him like this one. 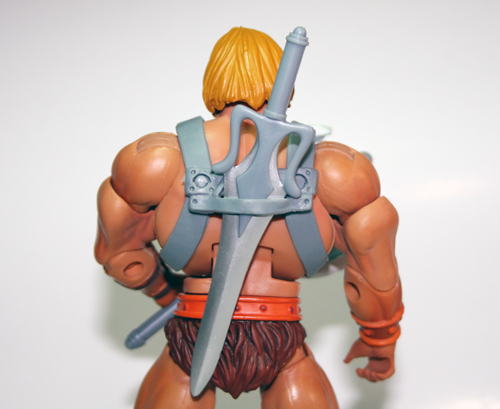 Most figures in this line come with 3 or more accessories, He-Man comes with a Sword of Power, Half Power Sword, Battle Axe, Shield and a removable Chest Armor, all similar to the original figure but way more detailed. The Chest Armor has a slot / holder that fits the Sword of Power or the Battle Axe so you don’t always have to display the figure holding his weapons. If you are a MOTUC collector and noticed a color change in the Chest Armor, than Kudos to you 🙂 My He-Man figure has the Chest Armor that came with the Green Goddess figure, which is exactly the same as the one that comes with He-Man but the gray is not as dark and fits better with the weapons color scheme. 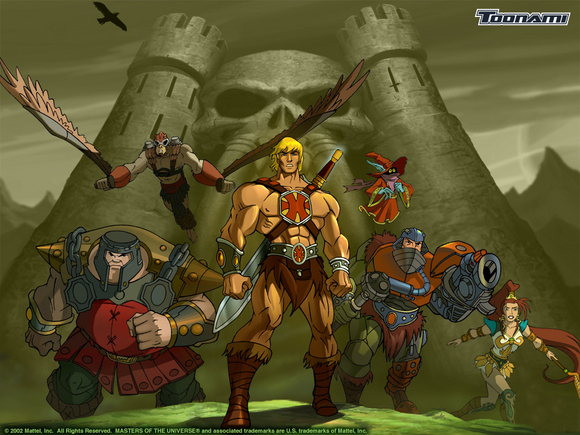 He-Man is indeed a must have figure if you are a MOTUC collector or just a nostalgic fan of the original toy or cartoon. 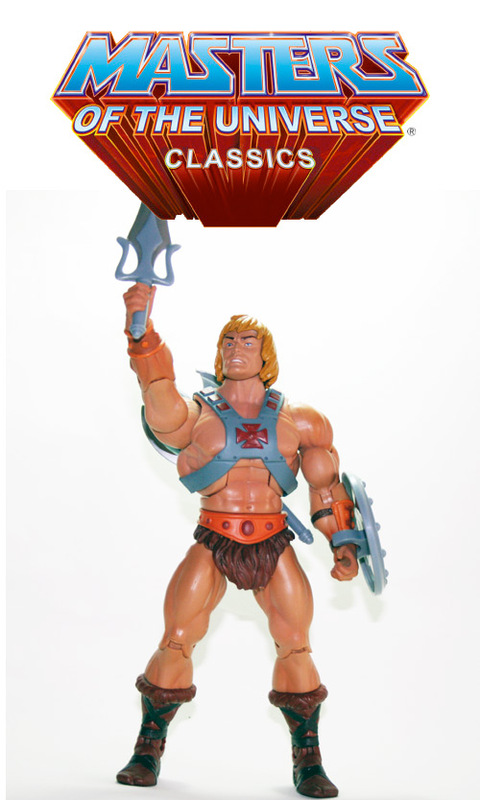 It’s not available at the moment at Mattycollector.com but you can find it easily on eBay or in the He-Man.org Forum Marketplace.